An idyllic location and touring base in the Esk Valley 3 miles from stunning Eskdale, these two adjoining holiday cottages provide comfortable accommodation in the peaceful western Lake District with glorious walks in every direction. Sharing 12-acres of pasture and woodland rich in wildlife with red squirrels, deer and many varieties of birds including barn owls, and many places for you to go climbing, cycling, strolling along the river or simply relaxing in the tranquillity of the garden, the properties make an excellent holiday base. Visit Muncaster Castle with beautiful gardens, or Ravenglass where you can enjoy the beach or board the miniature steam train and hop on and off exploring the Esk Valley. Wastwater, voted Britain�s Favourite View in 2007, is 6 miles away framed by the magnificent fells of Great Gable and Scafell Pike - on a sunny day a truly unforgettable view. To the north lies the historic port and marina of Whitehaven with a variety of shops, restaurants, museums and water sports. Shops, pub and restaurant 3 miles. Ground floor: Living room. Dining room. Kitchen. First floor: 3 bedrooms: 1 double, 1 twin, 1 single. Bathroom with shower over bath and toilet. Dishwasher, Fuel & power included, Linen and towels included, Parking available, Rural, Shower, Telephone, Washing machine, Winter short breaks, Woodburning stove, Enclosed garden. 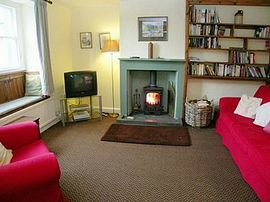 Woodburner in living room inc. Gas CH, electricity, bed linen and towels inc. Digital TV. DVD. CD. Electric cooker. Microwave. Washing machine. Dish washer. Telephone incoming and local calls only. Shared 12-acres of pasture and woodland. Natural water supply from spring. Lawned garden with patio and furniture. Parking (2 cars). NB: 2 steps to grounds and fenced stream. Very pretty, cosy and warm..
open barns, wood store, tumble dryer in barn. £200.00 - £700.00 per week. Friday-Friday lettings and short breaks available weekends or midweek.